These provide an opportunity for group members to display their literacy skills and also share information gained from the topics covered in the sessions with their wider communities. One group member is responsible for organising the notice board and encouraging others to contribute to the displays. Every family literacy group member is encouraged to write to someone in a neighbouring group. These letters are exchanged when the facilitators meet. Pen friends meet at the end of year event. This started when group members were asked to write to the FLP as a way to get adults to use their newly developed literacy skills. These letters were printed, followed by a few pages with news and photographs. The newsletter is now professionally laid out. It is very popular as it is filled with news from the different groups, and members eagerly look for their name in print and for photographs of their activities. The FLP supplies a notebook to each adult to keep a journal with a child. The adults and children choose a picture to paste into the book or draw one, talk about these with their children and the adults write down the conversation in what are called Umzali Nengane (Parent and Child) journals. Each group is given a box of books to use in their literacy sessions and from which to borrow books to take home to read with their families. 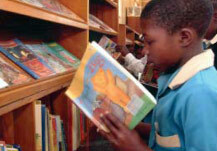 These box libraries have books in English and Zulu, for adults and children, and include reference books such as dictionaries and atlases. At Stepmore, the facilitator noticed that the group members were discussing books together. This led to the first FLP book club, something that has spread to every group. Adult groups were introduced to the concept of key-hole and door-size gardens in their literacy groups, and in 2013 built a demonstration garden at each site. This project links with the nutrition component of the IMCI and home visiting programmes and requires group members to use their literacy skills in accessing and recording information. Groups built either a door-size or key hole garden, and one member from each group volunteered to take on overall responsibility for the garden. The aims of this activity were to encourage members to increase the variety of vegetables consumed by their families, to provide training in planting a variety of vegetables over a longer period than usual and enabling elderly people to tend their gardens more comfortably. Before FLP sourced the first community library, group members visited their neighbours to see whether they would use a library. The results were overwhelmingly in favour of having a library and, with perfect timing, we were asked by the NGO Biblionef if we would like a container library. The bright blue container arrived in Stepmore and our first community library was opened in November 2003. Library furniture was provided by the provincial library services, books by Biblionef, Exclusive Books and other donors; group members catalogued the books and set up the library. The library is open to anyone in Stepmore and is run by one of our group members, with support from the facilitator. 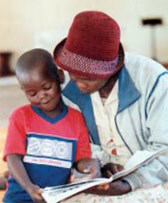 Today, FLP supports four community libraries which have been built with funds raised by the project. We employ four literacy group members to work in these libraries five days a week. In 2012 we received funding from the National Lottery Distribution Trust Fund for jungle gyms and swings, and for fencing. 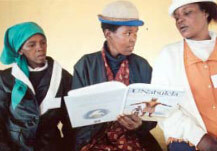 In 2012 over 10 000 books were borrowed from the community libraries and box libraries in the 15 villages where we work. 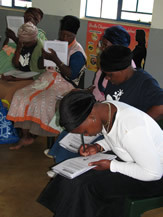 The group members’ desire to spread the message of early literacy gave rise to the home visiting scheme. The women take books with them to read to children; they also talk to mothers and grandmothers about their role in the development of their children. From 2004 we included health messages in our literacy sessions based on the Integrated Management of Childhood Illness strategy (IMCI). Members applied these early literacy and IMCI messages in their own homes and then shared what they had learned with their neighbours. They also played with the very young children in these households. In this way, the family literacy message was spread to people who were not attending FLP sessions. In 2010 we undertook a two-year pilot focusing on 0-4 year olds, as these babies and toddlers are often not engaged in activities that provide the stimulation that they need to develop language and skills for early literacy. After an evaluation of the programme at the end of 2012, we refined the materials into what is now our Khulisa Abantwana home visiting programme which is being used with FLP groups and also in the government funded Community Works Programme (CWP). In 2013 we trained 175 CWP workers who each visited six homes in their own village, speaking to primary caregivers about stimulation, safety and good nutrition for very young children, and also playing with and reading to the children. In 2014 this programme will expand to new villages in the district, and new materials are being developed to extend the information that home visitors can share with households. We will continue to provide training to coordinators who in turn will support home visitors in villages where we worked in 2013, to ensure the quality of visits is maintained. For over 10 years we have worked with foundation phase children who meet once a week to listen to stories, read books in their home language, draw, write, and generally have fun while learning. 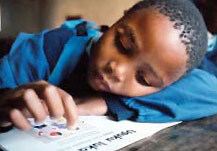 From 2012 we aligned with the Nal’ibali reading for pleasure campaign because our approach and aims are much the same. 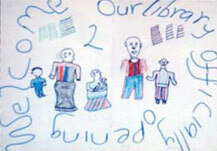 We currently have 20 reading clubs for foundation phase children in 14 villages in the district. We also have a teen group participating in research for the Nal’ibali campaign. Our Literacy Coordinator, Phumy Zikode, writes learning units for our facilitators, based on ideas and activities in the Nal’ibali supplements which are published by Avusa Media. The children love making their own books from the supplements, they compose their own songs showcasing their reading clubs, they write and draw, and participate in many different types of reading and storytelling. Due to the high rate of teenage pregnancy, FLP developed materials for girls 9-12 years of age to help them understand their changing bodies and at the same time to build their self esteem and encourage them to think about their future. The six-month programme was so successful that we extended the material to cover a year, and included information about careers and exercises that encourage self awareness. Our teenage groups meet once a week to discuss issues around relationships, sexuality and HIV+AIDS. We use the Auntie Stella materials, developed in Zimbabwe, which encourages discussion around topics which primary caregivers are generally uncomfortable raising with their children. In 2014, we are introducing teens to Peace Clubs, a programme focusing on managing conflict, emotional intelligence and bringing about positive change. We run holiday clubs for children at the four libraries during every school holiday. These are fun-filled days, when children make a variety of crafts, play games, make puzzles, sing, dance, read and are read to. Many children in the areas where we work are expected to do household chores during their holidays. But once parents see the lovely craft items they make, they allow their children to visit the library instead of working. This 8-week counselling course is offered in 5 schools and to youth in the two low income housing developments in Underberg and Himeville. These bereavement groups assist children to better cope with the loss that they experience, such as loss of siblings, parents and other family members. Our facilitators offer support to individual children who need extra intervention. Research into this programme is being conducted by Jacqueline Horn as part of her studies towards her Masters degree. Once adult literacy group members have been meeting for 7 years, they they may join our Family Literacy Network, which encourages the members to be less reliant on FLP. While they no longer meet for literacy activities with the FLP facilitator, all these groups have chosen to continue to meet once a week to engage in small income generating projects. Some of the groups make craft items like rattles that are used in the project. The groups also run their own savings clubs based on the Save Act model. 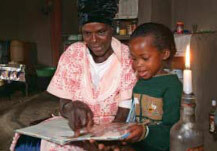 The FLP facilitator continues to support them to do home visits. In these was the Network encourages members to use their new found literacy skills to improve their lives. 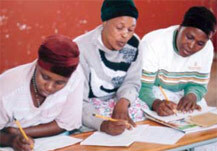 Vukuzakhe Projects has for years provided bursaries to deserving students and learners. In 2011/12 an amount of R218 000 was shared amongst 11 students and learners to enable them to enrol in University courses and in primary school. In 2014 bursaries have been awarded to 1 student to attend Rhodes University, two students to attend FET college, and for six learners to attend primary school in Underberg and Himeville. The project also distributes stationery, books and toys, donated by the Generation Joy programme of Seattle, to schools and families in the district. Every year the project distributes between 40 and 50 bicycles to children who participate in a literacy group in Himeville and Underberg on condition that they have not previously received a bicycle, their school results place them high in their class, and they regularly attend literacy sessions.